The objective is to propel as quickly as possible with the elastics the maximum of shuffles through the trapdoor in the opposite camp. But beware, your opponent plays at the same time and does the same thing as you! Exciting games await you and intoxicate the players as well as the spectators. 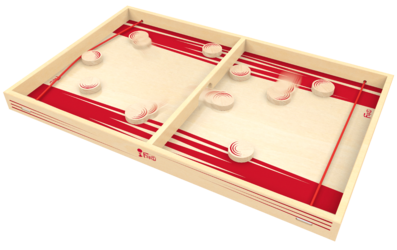 A superb achievement in solid wood, LE PASSE-TRAPPE is intended for all players from 4.